The 2011-2012 school year is coming to a close, and if you are a senior, that means deciding what you will do with the rest of your life. College may be the right choice for you, but you do not have to leave the state to become a student at one of the country’s best universities. Pennsylvania is home to many of the best universities in the world, and nearly anyone can find a university here that will suit their needs. In the table below, you can find some of the best universities in your home state, as ranked by U.S. News. 1. Founded by Ben Franklin, the University of Pennsylvania is one of the best universities in the world. It is a member of the prestigious Ivy League and is best known for its business, law, teaching, engineering, and medical programs. Established in 1751, Penn is one of the oldest universities in the nation and is located in Philadelphia, one of America’s most historic cities. Penn is also famous for developing the first digital computer, the ENIAC. Many business leaders, including Donald Trump, have graduated from this prestigious college. 2. As philanthropist and industrialist Andrew Carnegie stated, “My heart is in the work.” Students at Carnegie Mellon University definitely have their heart in the work, as Carnegie is known for having one of the most difficult programs in the country. While the work is hard, a degree at Carnegie Mellon is a valuable one, and students there are seen as leaders of tomorrow. Carnegie is best known for computer science and is tied for the best program in the country. Carnegie is also known for its engineering, business, and arts programs. 3. Lehigh University is best known for its engineering, science, business, and teaching programs. Lehigh is one of the most selective colleges in the national, and according to the Wall Street Journal, it has the twelfth highest return on investment. Lehigh is known nationwide for its research programs. In addition to their educational programs, Lehigh is known for its Campus Square: an apartment building with an ice-cream store, bookstore, market, bagel store, patio, and lounges. 4. Chances are, if you say, “We are…” anywhere in the world, you will hear a responding, “Penn State!” With over 38,000 students, the Pennsylvania State University is one of the largest colleges in the country. Despite the fact that it is huge, it carries the feeling of a suburban campus. Penn State is well known for its engineering and teaching programs, but it is much better known for its football program. Beaver Stadium, the massive home of the Nittany Lions, holds 107,000 people, but it is still almost impossible to find tickets. Penn State offers a great social life with a great education and has been ironically ranked both the best partying school and most employer desired. 5. Located just outside the bustling city of Pittsburgh, the University of Pittsburgh offers highly ranked degrees in medicine, engineering, and teaching. This university, founded in 1787, is an all access pass to the city with free busing, access to museums, and more. The University of Pittsburgh offers an untraditional college setting where students feel like the city is their campus. This college is also known as one of the largest research colleges, working on national engineering projects in their Swanson School of Engineering. 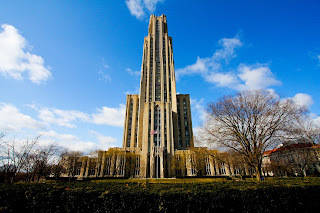 The campus is best known for its Cathedral of Learning, the tallest educational building in the country. Pennsylvania is full of great schools. The overall atmosphere is great no matter where you are in the state and every school has something special to offer. I personally went to a college in PA and I loved my time there. Not only was the school great but the entire surrounding area had everything I needed.